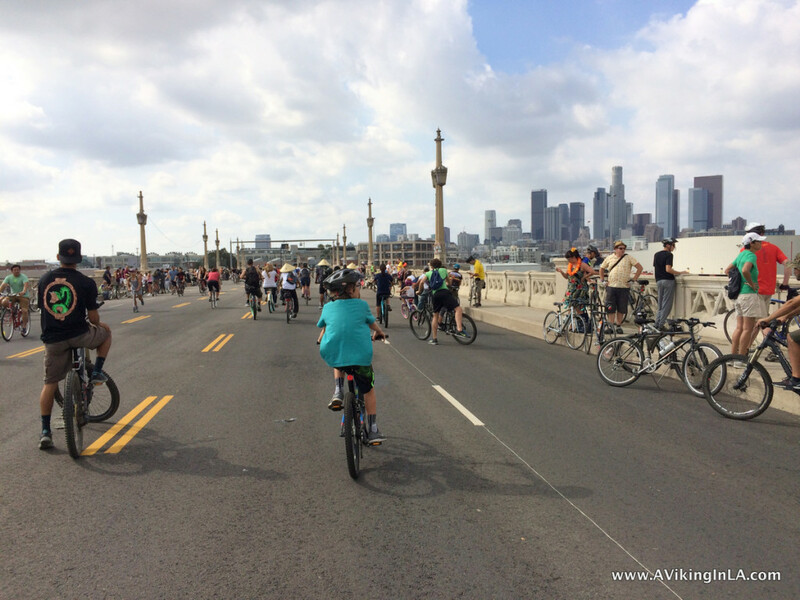 Last month I completed another successful and fulfilling CicLAvia experience. It was my fourth one, and each one has always been such a different and unique experience. I’ve gone through various iterations of family joining me: 6-year-old Doobie the first time in 2013, me alone the second time in 2014, the whole family the third time earlier this year, but it was just 11-year-old Sonny and me for this experience. 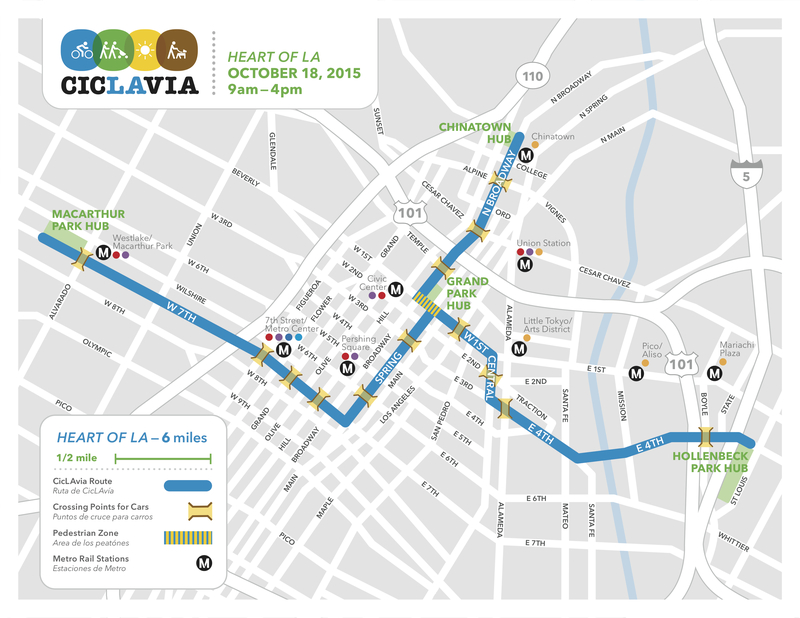 On October 18, 2015, CicLAvia celebrated its 5th anniversary with CicLAvia: Heart of LA, a route in Downtown LA. I studied up on the route so I wouldn’t miss anything of interest and had a great plan for the day. 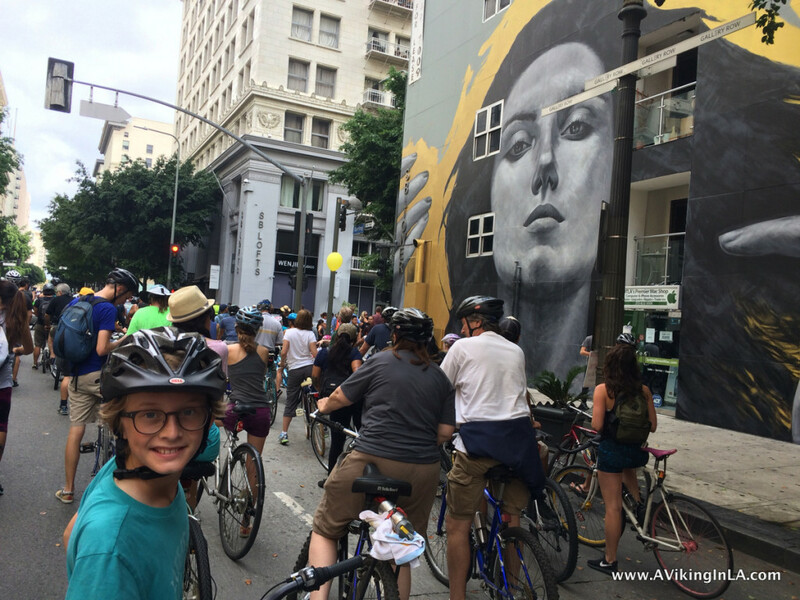 I had never planned and prepared so much for a CicLAvia experience as I did for this one, but it was such a new area for me to explore. Now that it’s over, I learned it was certainly helpful to have a general overview of how I hoped to proceed that day, but that an overly detailed plan was not necessary nor feasible and it’s just best to go with the flow. Other than we didn’t get out as early as I would have liked since Sonny had been at a sleepover, all started well as we rode our bikes to the Metro Rail and took it to the end of the line downtown. 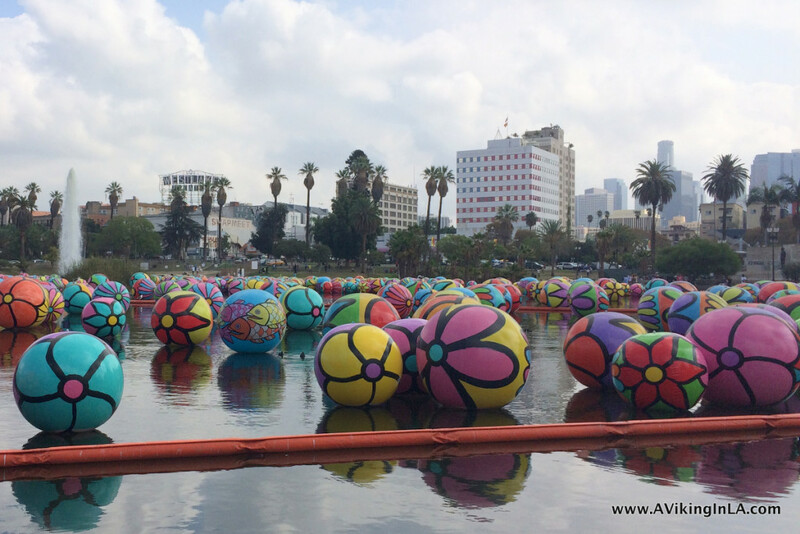 We first headed out to MacArthur Park as planned and saw the The Spheres as I had wanted. 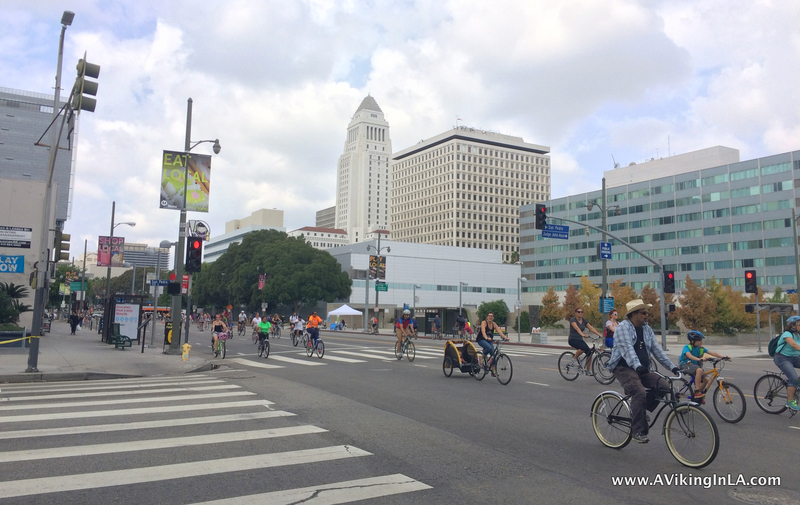 They didn’t disappoint, but it was kind of an odd experience walking through the park—there was the energy and excitement of all the CicLAvia participants, but at the same time homeless people were going about their business as if nothing special was happening. 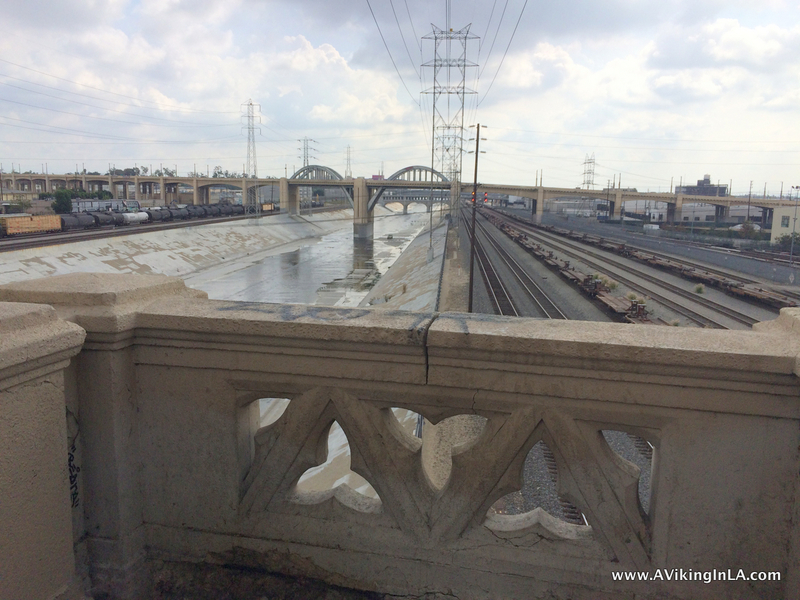 Our first stop at MacArthur Park was also where I realized all my plans would not work out as planned, in particular the geocaching ones. There were four geocaches in this area that I had wanted to search for. I quickly dropped two of them since they were on the opposite side of the park. We made half-hearted, unsuccessful attempts to find the other two; there were just too many “muggles” around to search without drawing too much attention to us. Sadly, I figured that would probably be the case for all, if not most, of the geocaches I had picked out along the route. Before moving on, we checked out the many food trucks at MacArthur Park Hub. 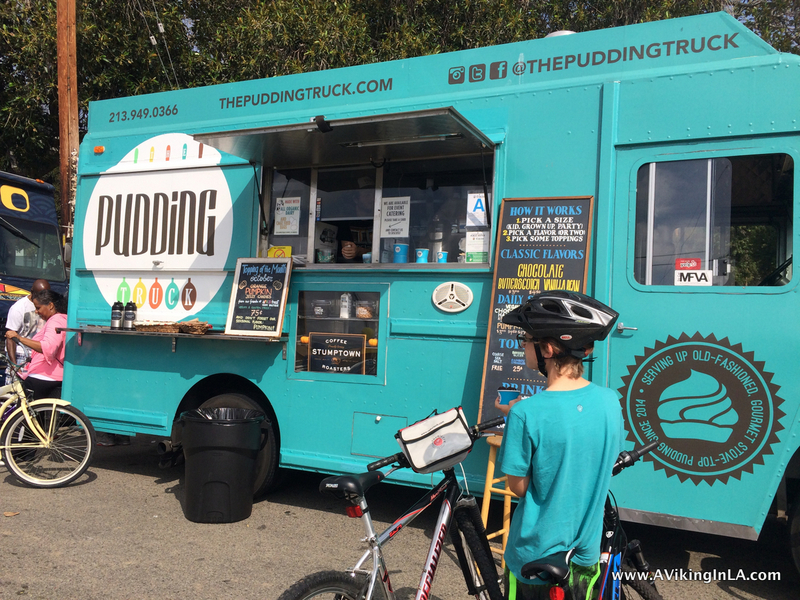 Sonny gave The Pudding Truck a try. The butterscotch pudding with brownie bites hit the spot before hitting the road again. On the way towards Grand Park Hub, I had planned to stop by Clifton’s Brookdale Cafeteria, The Last Bookstore, and the Globe Lobby of the LA Times building to see their unique interiors, but they were all on the wrong side of the street and the flow of the bike traffic just carried us along past them. Same was the case for a couple of geocaches along the way as well. There was still the chance we might be able to check them out on the way back. Before we knew it, we had reached Grand Park Hub. We continued on towards Little Tokyo, which was my next planned stop. On the outskirts of Little Tokyo, however, was a puzzle geocache I had prepared for and wanted to try if at all possible. 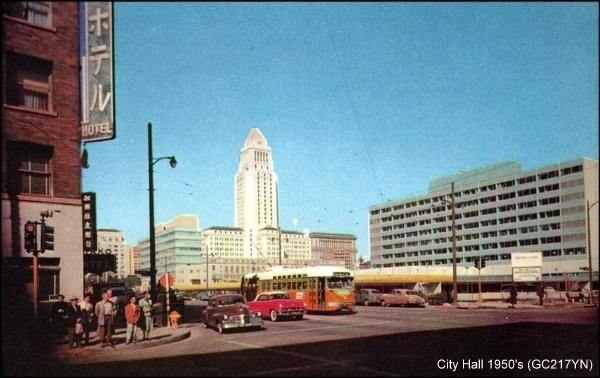 For this geocache, I had been given an old photo of City Hall from the 1950’s and had to figure out the spot from which the photo had been taken. The container would be in an “obvious spot” just a few feet from that location. If I had solved the puzzle correctly, ground zero was right along the route, too tempting to let pass by. Luckily, the spot was on our side of the street and it wasn’t busy. We were able to locate and make the grab easily. Interesting to see the differences and similarities in the area between then and now! 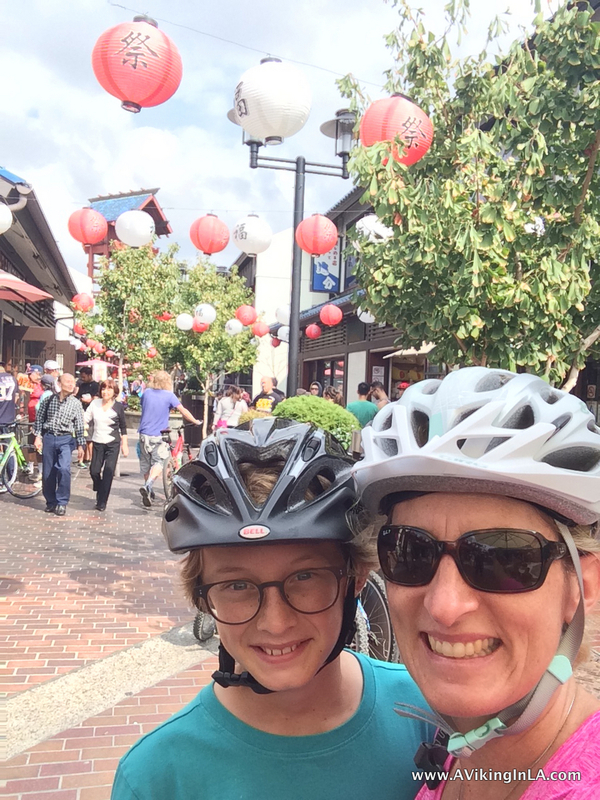 We parked our bikes when we got to the historic district of Little Tokyo. It wasn’t an official hub, but it was very busy with people exploring the area. We took a little stroll in Japanese Village Plaza and felt like we were in Japan. We enjoyed a drumming demonstration outside the Japanese American National Museum. We even ventured a little beyond the crowds to the Go For Broke Memorial which commemorates Japanese Americans who served in the United States Military during World War II (where we also had a some time to ourselves and were able to search for a traditional geocache). Time was quickly passing and Sonny was beginning to get a little impatient about all the time he’d already spent out on the streets with me. 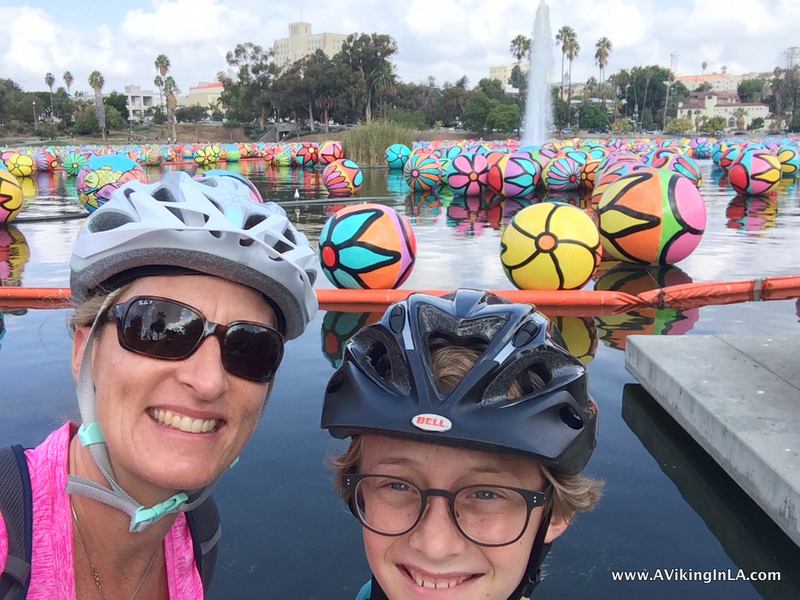 We got back on our bikes and pedaled through the Arts District, over 4th Street Bridge, and on towards Hollenbeck Park in Boyle Heights. We enjoyed lunch from a food truck at Hollenbeck Park. What struck me right away was how green the park was! These days, with the drought and cutbacks in watering, so much grass is usually brown, but not here for some reason. Riding 4th Street Bridge was my favorite stretch of the day. 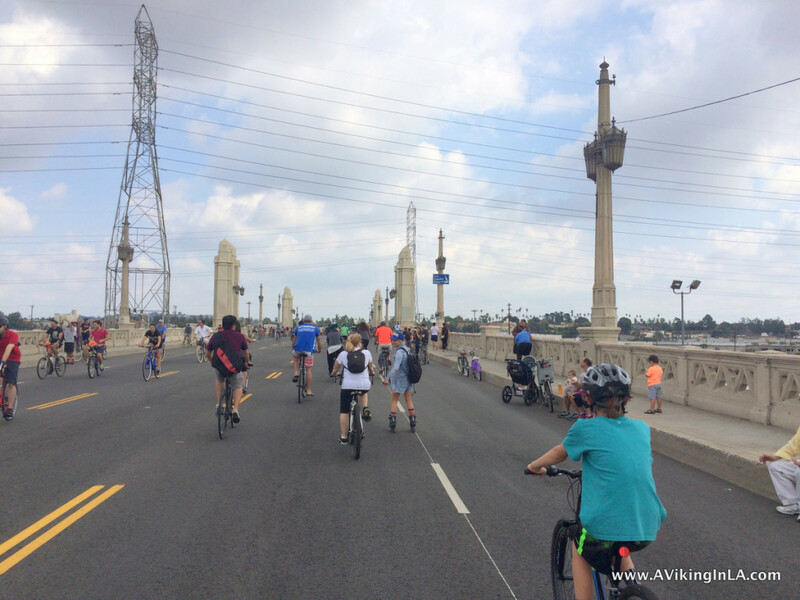 There was something about riding on this historic bridge built in 1931—with its Gothic Revival details, over all the railroad tracks and cemented LA River underneath, with the openness and views of the mountains and city around us—that awed me. It was a popular place for cyclists to get off their bikes and admire their surroundings. 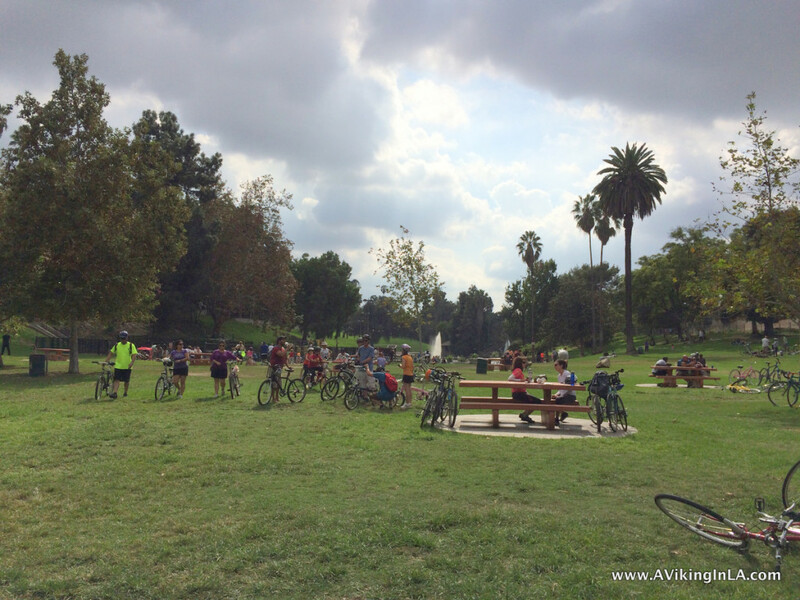 And I loved that we got to ride it twice, once in each direction coming back and forth from Hollenbeck Park. After lunch we pretty much peddled straight back to the downtown Metro stop to go back home. Sonny passed up a stop at a frozen yogurt place because he was eager to get home, but he did humor me with a quick stop right along the route near City Hall to take a picture of a sign post listing all the sister cities of Los Angeles. This was part of the requirement for a virtual geocache that I wanted to log (the other half was posting a picture from a visit to one of LA’s sister cities, which in our case was Athens, Greece). 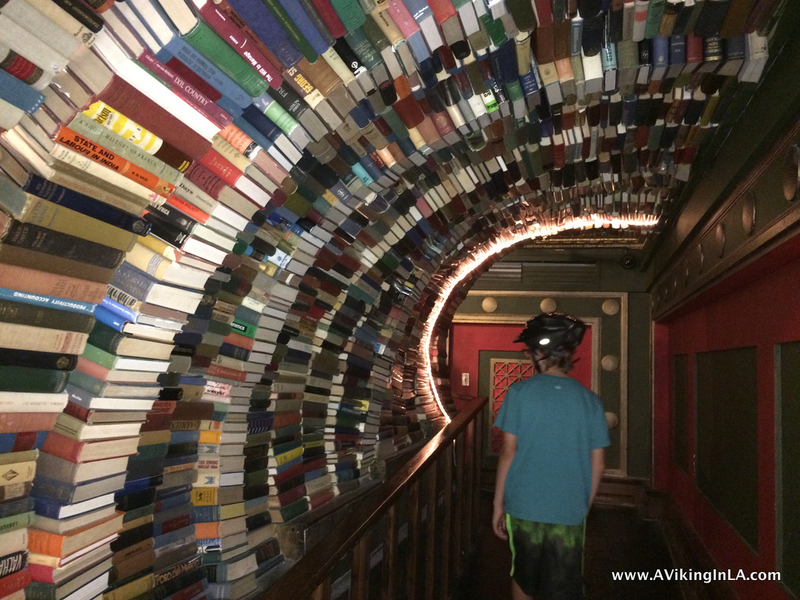 He also agreed to stop at The Last Bookstore to get a glimpse of that. I enticed him with the promise of a book. We browsed the downstairs, in particular the vinyl records section (a cultural history lesson for Sonny!) and the children’s and young adults’ book sections, before we headed upstairs and walked through the labyrinth. It was a short but sweet visit, and we learned it’s worth another visit if we’re in the area. At the end of the day, we had cycled 13 ½ miles and been out from about 10am to 4pm. We had explored a great part of Downtown that until now had been unknown and unfamiliar to us. I can’t say I now know it like my own neighborhood, but I am certainly more interested and open to going back and revisiting and exploring some more. Downtown LA is no longer a big, unknown area to me. Now when I drive along the freeway past the high rises and surrounding areas, I’ll have a new understanding and appreciation for the area. I’m always looking for new activities to do with my family when they visit. Now I can put some places in Downtown LA on our list. 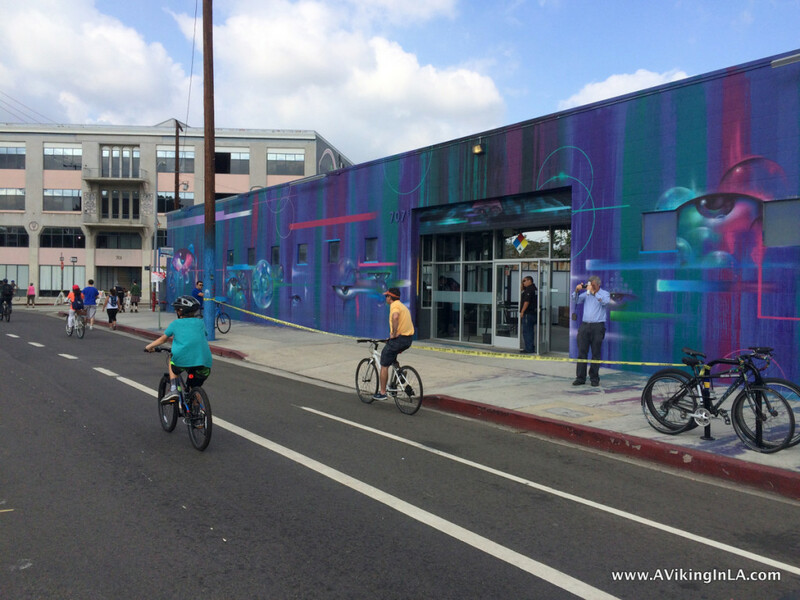 For those interested in participating in a future CicLAvia, there are two events coming up in the next few months. 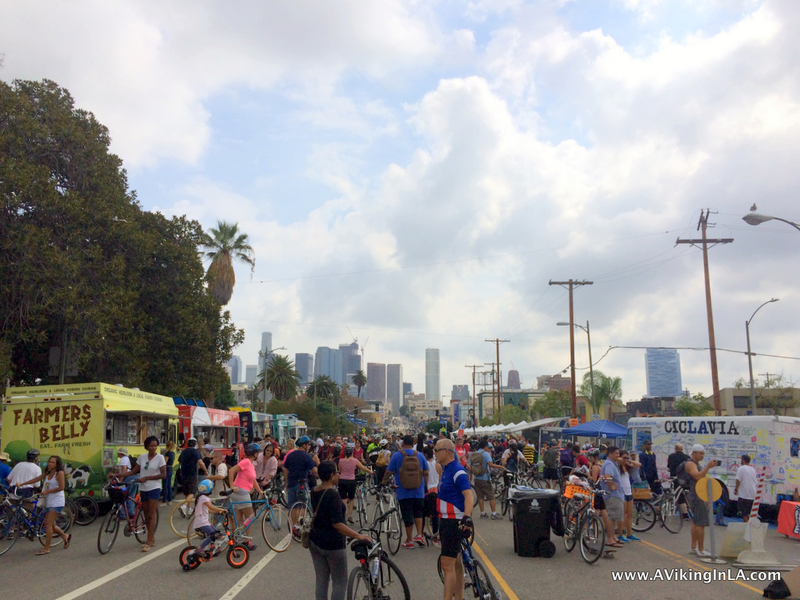 The first one is CicLAvia: The Valley on March 6, 2016, and the next one is CicLAvia: Southeast Cities on May 15, 2016. Are you tempted to mark either of those on your calendar? I hope to be able to do the Southeast Cities one. 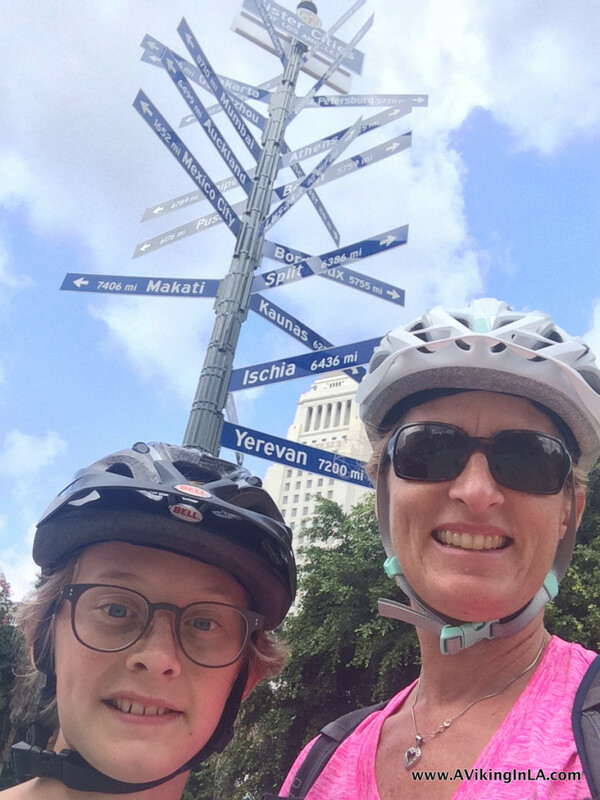 This entry was posted in Los Angeles & Environs and tagged biking, Boyle Heights, CicLAvia, DTLA, geocaching, Hollenbeck Park, LA River, Little Tokyo, MacArthur Park, Metro by Patricia Zanuck. Bookmark the permalink. Great reporting from what seems to have been an interesting day “in your own neigbourhood”. So fun! I want to comeback too!